Forum Index > Off-topic Talk > Philosophy of your Kit/Collection? Posted: Sat 10 Oct, 2015 10:57 pm Post subject: Philosophy of your Kit/Collection? Two years ago, I sold virtually all of my reenactment goods to fund a travel opportunity, and have since been without even a single set of clothing suitable to wear to a day event. Lately I've been researching what period I might want to devote some energy and resources to in order to "get back into the game." My quest - which as of yet is inconclusive - has made me reconsider some fundamental aspects of reenactment from a personal perspective, as well as of incorporation into a group mentality. I believe these questions, which are aimed at reenactors, are also valid for collectors. So, if you feel that your collection reflects your interests in particular ways, let us know how that's so! Some of the questions that have come to mind for like double-edged blades. Some folks like to be unique, and there are still many "impressions" that have seen rarely or even never achieved among the reenactment community. However, having a unique kit to go to prolonged events begs the question - which events to attend? There are some diverse events in the United States where many kits would certainly be welcome, such as Days of Knights or Marching Through Time. However, not all kits lend themselves to many of the more serious, period-specific camping events, such as Crossroads in Time (c. 1300-1500). Or, one could build a harness to match the needs of the locals, such as armored WMA groups. Another major consideration is how a particular kit is appealing to your personality and tastes. Like choosing a car, reenactment kits are a reflection of one's priorities and aestetic sensibilities. Do you want something that aligns with the history you admire and study the most, or something that allows you to experience life in a new way (such as sword fighting versus archery versus making music, perhaps)? What moves you to consider a particular period and kind of kit most suitable for your personality? Balancing the differences between creating something new, aesthetic pleasure, historical relevance, and the possibility of joining others at events, can be hard to juggle! As many here are also reenactors or serious collectors of historical reproduction armament, I think that such questions are probably common among our lot. If you have any insight into your previous considerations and possible sacrifices in one arena or the other, please share... Cheers! Posted: Sun 11 Oct, 2015 8:35 am Post subject: Re: Philosophy of your Kit/Collection? Two years ago, I sold virtually all of my reenactment goods to fund a travel opportunity, and have since been without even a single set of clothing suitable to wear to a day event. HOLY SMOKES! I hope it was a great trip! I could never ever do anything like that. I've only sold a few things over the years, and have never really felt comfortable doing so. I guess, for me it's all about the STUFF. And what I make (or very rarely, buy) is driven largely by my mood swings. With other stressful things in my life, it has become pretty important for me to do what I want, when I want, regarding my Hobby. When I was fresh out of college with my first real job and still living with my folks, I had enough money to start buying swords. That was back when MRL swords were mostly Del Tins, and I bought 8 or 9 of them. Several have been off the wall only a couple times in 30 years, but they're going on my funeral pyre with me. (Well, okay, there might be a REALLY COOL yard sale instead, ha!) Those swords were instrumental in setting my personal level of quality and historical accuracy reasonably high, and I've never looked back. Nowadays, while the mood sets the direction, I only rarely dare to spend up to a couple hundred bucks on a particular project. Poplar planks for my best Greek shield were about $60, and I think I spent maybe $150 on boar tusks for my Mycenaean boar tusk helmet. Probably about that on leather for my Greek armor. Much as I'd love to upgrade my old home-made coat hanger butted-ring mail hauberk, I just can't justify buying a riveted shirt that will only get used once or twice a year. I'm not a member of any medieval group. Sure, it would be fun to do more, but there are only so many weekends that I can escape from that "real life" thing... But if I dig through the basement and come up with enough materials to make a Bronze Age Sardinian shield that may never get used, cool, I go for it! And I did. Never even finished the tunic to go with it, but it's a cool shield! And it's what I wanted to work on at the time. I need to order some leather, but that will last for years, and I can make most of the money back using some of it to make shoes and other stuff for my Romans. So I count that as an investment. Same with glue, paint, sandpaper, etc. Otherwise, I hit the thrift shops regularly for linen and wool, and keep an eye on several dumpsters for metal and other goodies. I'm lucky enough to have several venues for some of my more obscure impressions. So if I'm the only Romulus in the US, no problem! I get all the attention at the Founding of Rome event, eh? I've gone quite mad on Greek stuff in the last couple years, but 2000 high school students tried on all my helmets and armor at the Virginia Junior Classical League convention, and I was able to outfit 5 friends to form a contingent for the Baltimore Greek Independence Day parade. It's really neat to be on the cutting edge of stuff like that, as well as a challenge. I did spring for a new pair of 17th century shoes a couple weeks ago, at the St. Marie's event, but I've needed those for years. That's getting into an era where I can't just make everything myself, but I have more than the basics already so it's no problem. If I only wanted to do events with 500 or more guys, I'd only do Civil War, eh? Sure, I'd LOVE to have more hoplites to play with, but until then I'll keep making shields and swords and new greaves and a couple more spears. As long as there are visitors who want to look at my stuff and listen to me babble, I'm having fun. Lately I've been researching what period I might want to devote some energy and resources to in order to "get back into the game." my kit is that of a byzantine infantryman of the 10th century AD, similar rank and function on the field to a roman legionary or macedonian phalangite, with pike, kite shield, and sidearm, armoured in mostly very dense cloth armour such as a kneelength gambeson, probably a helmet if he's in the front rank a very thickly quilting/ compressed felt cap and turban if he is not. I sold most of my collection to help pay for Andrew's Dendra Panoply when it came up for sale about ten years ago. Since then I have been very picky when selecting pieces to collect. I only buy one or two things per year and go to a lot of trouble to ensure that they are as close as possible to the museum examples. I'm not interested in re-enacting; I like to have pieces that can help with researching a particular subject. Posted: Mon 12 Oct, 2015 7:19 am Post subject: Re: Philosophy of your Kit/Collection? Much as I'd love to upgrade my old home-made coat hanger butted-ring mail hauberk, I just can't justify buying a riveted shirt that will only get used once or twice a year. Mail garniture? You could make a mail shirt with a detachable hamata shoulder doubling? It can be left on for Roman events and removed for Medieval events. A single shirt could then be used for a wider range of occasions. Some detachable long sleeves could perhaps be another interchangable component. Aesthetics plays a huge part for me. I always had a very specific look that I wanted to achieve with my armor. Love the look of mail so I wanted a hauberk to be the centerpiece of the outfit, but on the other hand the head-to-toe mail of the 1100 – 1200s knight didn’t have enough visual variety for me. Go forward a couple hundred years though, and you still have the mail hauberk, but now it's being supplemented with interesting plate and splinted elements. 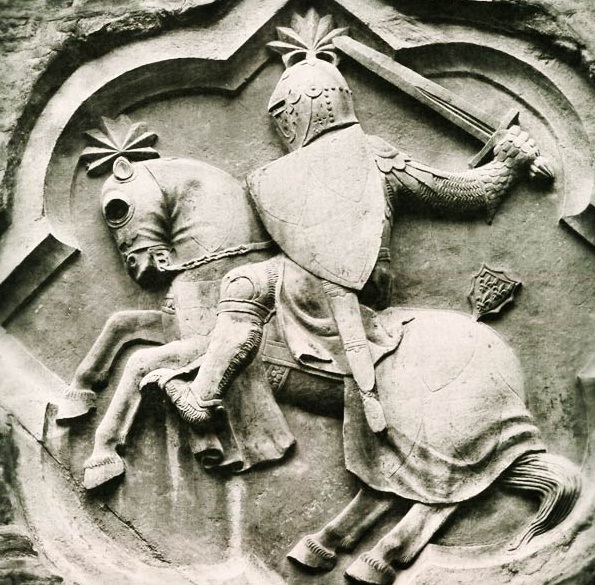 The late 1300s knight with visored great helm, mail hauberk, splinted limbs, and coat-of-plates or early breastplate, is the image that comes in my head when I hear the word "knight". Elements of mail, splints, scale and plate have a lot of visual variety and make an appealing combo. As an aside, can anyone ID a source for the second illustration? I pulled it from another forum a long time ago but was never able to find the original source or any effigy references. Seems like the rise of "cosplay" would provide options to use even the most obscure kit. Scouting and education groups are often looking for interesting speakers. A great kit could do some real good in helping people understand history and arms and armour. 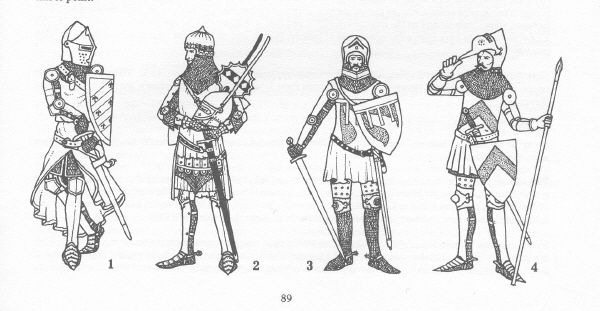 I'd love to make one good, complete kit--probably late 15th c. or early 16th c. English infantryman. Mainly just to better understand the period. Makes more sense to me to put all energy, skill and resources into a single perfect kit that can be used to teach than to have a dozen kits that are only kinda-sorta and aren't of much educational value.